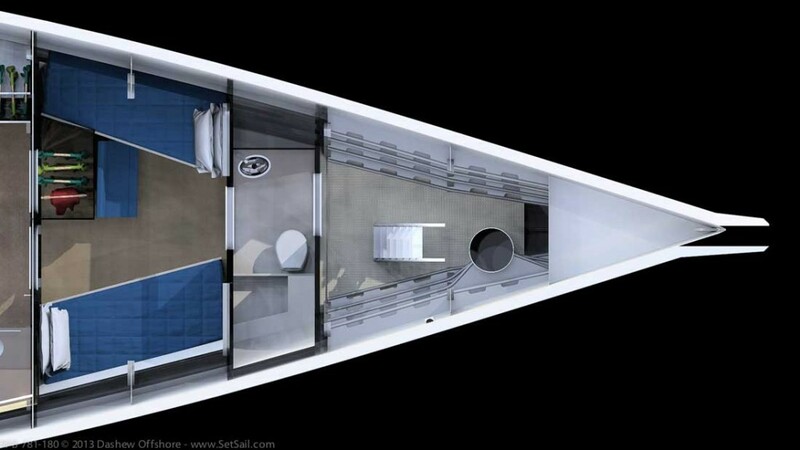 We are in the process of designing crew quarters for our FPB 78. With no experience cruising and/or living with crew, we are working in a theoretical world rather than reality. If you are a professional crew, or an owner who has lived with crew, we’d love to hear from you. There are a series of tradeoffs in any yacht design, many of which involve how the yacht is to be used. When crew is involved the design spiral becomes more difficult. How much space does the crew warrant and from whence does this space originate? Do you use some of the area devoted to the ship’s equipment storage, or is it better to cramp the crew? With the FPB 78 Dream Machine we are thinking it may be possible to satisfy both vessel and crew. This is a function of starting out with sufficient storage in the first place. With the FPB 78 there is plenty of storage space for ship’s gear as well as “toys” in the lazarette aft, so that a large chunk of the forepeak could be used, if warranted, for crew. You can get an idea here of what is potentially available in the way of efficient storage space aft. In addition to which we have these two large lockers accessible from the swim step. The plan view above has a 300mm/one foot grid superimposed. If you count aft two feet/600mm from the foot of the ladder, this is the position of the bulkhead on the FPB 64, relative to the chain locker. The column left, above the floorboards, is equal to an empty FPMB 64 forepeak. In other words, there is a fair amount of volume. As crew (and here we are talking one person or a couple), at anchor or in port, would you prefer your own isolated quarters forward, with access from on deck, or to be in the aft starboard stateroom, where you rub elbows with the owner? If the aft stateroom is being used when family or friends visit, it may be necessary to move to the forward crew cabin so both guest cabins are available. The side decks are covered with a roof overhang. There are set of “man lines” from the forward corners of the roof overhang to the mast. These could be used for an awing or a pram hood/cover over the foredeck hatch for protection. In wet environments – say the tropics with squalls coming through, or higher latitudes in light rain or heavy fog – would you rig the awning or pram hood, or just make a dash for the hatch? 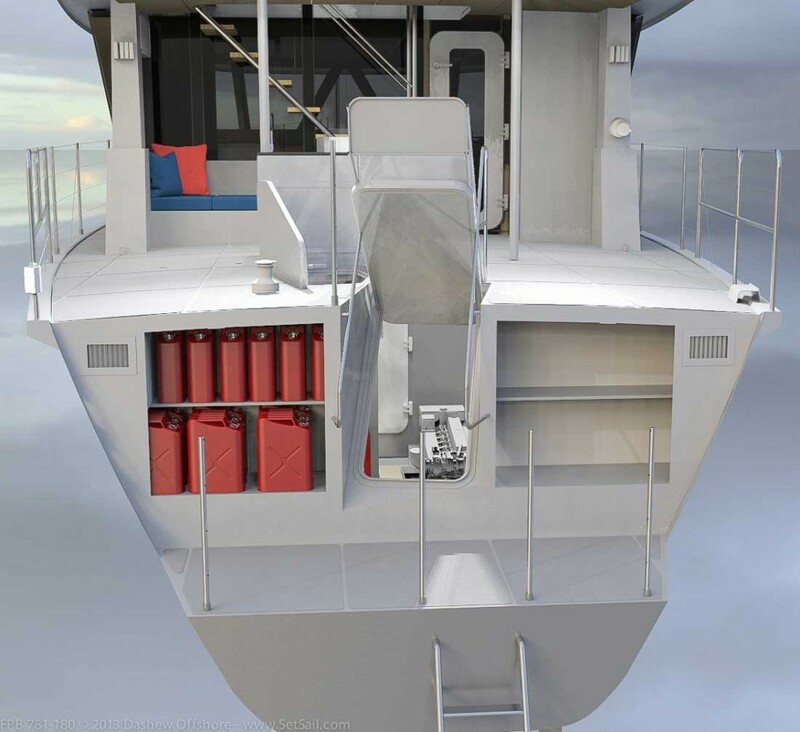 If you are moving the boat, and the owner is not aboard, would you move to one of the guest cabins, or use your own forward cabin, but access it through the owner’s quarters (there is a watertight door in the bulkhead separating the crew and owner areas)? How important is a hanging locker, and what hanger rod length would you like to have? How much drawer volume, or how many drawers of a given size would you like? Does it make more sense to make the aft starboard cabin the primary for crew, with the potential of access via the deck,work shop, and engine room direct through the starboard head? If the answer to the question above is in the affirmative, and the forward cabin is for use of the crew when the starboard cabin is used by guests, does it makes sense to dedicate part of the work shop area to a crew “hang out” area? In this case the crewarea forward wouldl be smaller so there would be volume available to stow gear to compensate for what was lost aft. Let’s move on to our theoretical layout. We are using the 3.2 meters (11 feet) forward of the owner’s quarters in this layout. The bunk to starboard is 90cm/three feet wide, 2m/6.5’ long, and 90cm/three feet off the sole. The port side bunk is 70cm/28” wide, and the aft 60cm/two feet outboard of the hanging locker punch out for the owner’s suite. This bunk is 1.15m/44” off the cabin sole. There is a settee, and lots of storage under the bunk. The head area has a dedicated shower (not a wet head), vanity, and toilet area. On the port side outboard are a pair of air conditioning compressors inside a locker. This locker is available for crew’s gear as well. The vanity would have a pair of drawers. On deck there are hatches for the sleeping cabin and head. The foredeck hatch is 1.4m long. There is also a Dorade vent for both spaces. We’d love to get your feedback. Any and all suggestions are solicited. Everything is on the table except the watertight bulkhead location and the intrusion of the owner’s hanging locker. If you think more forepeak space is needed, let us know. If less works, let us know that as well. PS:If you click here you will find a long post on the FPB 78. Towards the end there are a series of layouts we have or are considering, in addition to what is shown here. This entry was posted on Tuesday, December 10th, 2013 at 1:26 pm and is filed under Dashew Logs, FPB 78, three. Both comments and pings are currently closed. As somebody who has lived before the mast on destroyers I’m used to pretty secure quarters because I served after tin cans became huge. The notion of going on deck that far forward in any kind of weather is dismaying to me, but that is largely because taking chances on ships that can carry thermonuclear devices was frowned upon. Eventually, risking your life unnecessarily meant that everybody died. I can easily envision a rouge wave taking a crew member on his way to or from watch, but I’m used to thinking in terms of the multiplication of small chances becoming inevitability. If I had a choice, and the Matrix deck was enclosed, I’d probably rack out in a sleeping bag up there instead of risking a midnight run on deck. I am intensely safety conscious and probably would not be a good model for a younger crew member. In port the forward berthing would be no big deal, but your hull is designed to take green water across the bow and keeping from swamping the forward hatch would worry me, too. Have you considered putting a heavy curtain or drape to separate the owner’s cabin at sea so that a virtual passageway could be created? I don’t think this would be optimal, but it would be lighter, cheaper, and more readily struck than a solid partition. It could be an inflatable curtain, which would add sound isolation, rigidity (assuming a floor connection for the curtain), and allow you to stow a bulkier partition more readily in port. Also, it would function as an emergency raft, worse came to worst. The crew quarters forward would not normally be used at sea. We are assuming the starboard aft cabin would then be pressed into service. Congratulations on a great website and interesting projects that I have followed with a lot of interest for many years now. I work as a full time professional yacht engineer onboard but I’m currently working ashore in Holland doing a new build of a large sailing yacht. As professional crew I would prefer to use the STBD “Guest cabin” because it will keep you a lot closer to the working areas of the boat in case of problems(they always seem to occur in the middle of the night for some reason). Instead of having to run outside or through the owners cabin you can step directly into the engine room or up the stairs to the great room. On a yacht of this size there is no real possibility of isolating the crew and owners party from each other anyway as you do on a large yacht with separate crew mess for example.All you have do is close the cabin door when you want some privacy. Since the fwd crew area would probably be uncomfortable in any kind of head sea and as mentioned above not used during passages then it’s nicer to have your own cabin(as we live onboard full time)and not have to move back and forth all the time. If the owners have more guests for a short period is OK to move up fwd but then a bunk bed or Pullman and a small wet head is enough. So i would probably go with the Office layout with small head for occasional use instead of a complete crew cabin fwd. As to cupboard space and drawers it is very dependent on cruising grounds, in the tropics you don’t need much but the mountain of clothes used for high latitude cruising is substantial and you will also need space to hang some shirts and nicer clothes for the occasional fancy restaurant visit. Also don’t forget to put in plenty of electrical outlets for all the chargers of todays “essential” gadgets and computers. Exactly the type of input we are seeking. 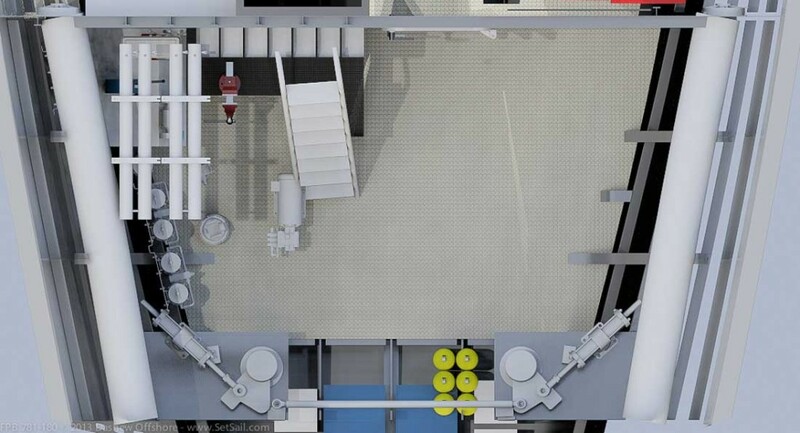 I am sure you considered this, but why not just make the master stateroom narrower and have a hallway going along the stb side to access the forward cabin? Your master stateroom design is beautiful and huge, but I wonder how much time you will really be down there give how nice the upper two decks are. Even with a hallway, it looks to me like the master stateroom would still be very large relative to most yachts. Have you tried this concept? 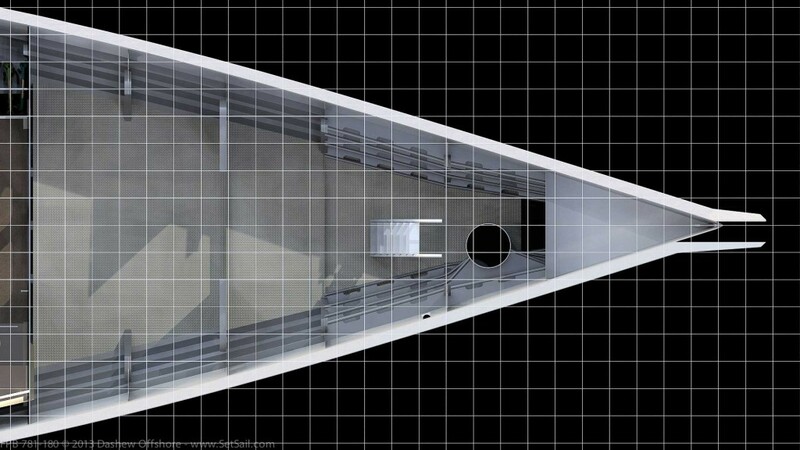 Having a hallway down the side of the boat, as well as moving the owner’s suite aft are concepts we have looked at in detail. For our desires, what we have here is the preference. We like the ambiance of the owner’s suite, and if necessary would just make the starboard guest cabin crew territory. That said, others might look at this tradeoff differently. It’s difficult to offer advice on your layout without knowing how you relate to your crew. While pondering your questions as I looked over your layout I wondered where your crew would sit down to eat? If not with you at your “dining” table , where? I suppose you could roster the great table and galley but that would be hard considering their location. With this question in mind I make the comment that your expectations of crew (and visa-versa) may be different from other owners of a 78. I don’t think the 78 is big enough to allow for the servants to enter out of sight,and stay out of sight unless they are working, and I doubt that’s what you want anyway. If it were mine I would move the owners suite aft and “Guest” cabins (that would include crew accommodation) could extend forward, all fitted out to the same standard. The most fwd cabin could still have deck access. I don’t like direct access to the engine room from the accommodation. And I agree with previous comments, I don’t think the forward deck access to crew accommodation will work well. When running this vessel you will still be making all the decisions, you just need a bit of help with operations, you will be mentoring your crew. This is very different from how many crewed vessels function. In my experience the crew use the best cabin they can if it is available, The master suite is always out of bounds. And on a happy ship the crew are content in pipe berth in the chain locker when a crowd is aboard. Interesting question about how folks relate to the crew. For us – and this is theory since we have never had crew – we’re not going to be shipmates with anyone who is not like a friend, which means we’d expect to be taking most of our meals together. However, we are thinking there can be such a thing as too much togetherness. So, the crew certainly need somewhere they can hang out as well. As to the forpeak at sea, we view that area as somewhere to be utilized when at anchor. Underway, there needs to be a more direct access. I’ve always thought the forepeak as the place for the grandchildren on our 64. And although we’ve never had that occasion, I’d surmise we would have the kids aboard only when anchored somewhere and not on passages. I guess what I’m suggesting is having a comfortable (at sea) permanent aft location for the crew and use the forward end of the boat for guests (that way they may not want to overstay their welcome!?). I know I’m not being very helpful. Actully, Bill, very helpful, and along the lines of what we have heard from severall professionals who have contacted us directly and on the web. Best cruising boats ever, keep getting better.